It’s been one of Britains longest running series of all time, but today Director General of the BBC, Lord Hall of Birkenhead, has confirmed that the final part of the weather will be screened on Sunday. 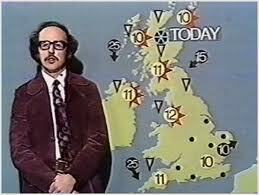 One of the early pioneers of the weather, Michael Fish has voiced his intention to come out of retirement to launch a new show which he hopes will enjoy similar longevity. Lord Hall has assured worried listeners that there will still be a posh lady on radio four saying dogger, fisher and german bite. “They love it because they don’t understand it” he explained.